Ambassador Thomas Niles served as president of USCIB from February 1999 until April 2005, capping a 36-year diplomatic career that included three key ambassadorial appointments – to Canada, Greece and the European Union – as well as service as Assistant Secretary of State for Europe and Canada. 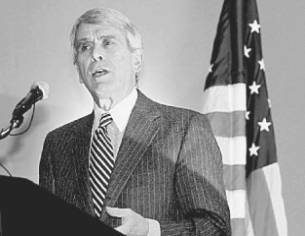 Appointed ambassador to Canada in 1985, Ambassador Niles played a key role in negotiations leading to the U.S.-Canada Free Trade Agreement, and he was widely recognized for his efforts to promote American business north of the border. As U.S. envoy to the European Union, he was closely involved in bilateral and multilateral trade issues as well as the developing political/security relationship between the U.S. and EU. As Assistant Secretary in charge of European and Canadian affairs at the State Department, Ambassador Niles was responsible for some of the first steps in the transformation of the NATO alliance, the opening of more than 15 new U.S. embassies in Eastern Europe and the former Soviet Union, and the establishment of diplomatic relations with the newly independent states. Earlier in his Foreign Service career, Ambassador Niles served in Belgrade, Moscow and the U.S. mission to NATO in Brussels, as well as at State Department headquarters in Washington, D.C.
Born in Lexington, Kentucky, Ambassador Niles holds a bachelor’s degree from Harvard University and a master’s degree from the University of Kentucky. He presently serves on the board of directors of Jacobs Engineering Group Inc. and on several advisory panels.